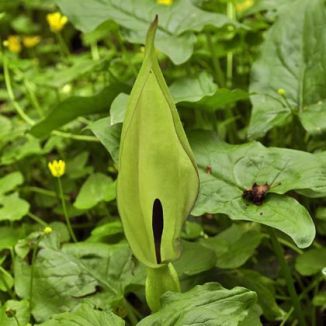 Lords-and-ladies is not easily confused with other wild plants on this web site. The most important thing to know about this plant is that all parts are extremely poisonous. 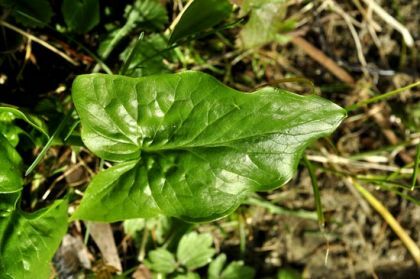 The first parts of the plant to emerge are the dark green, glossy, arrow-shaped leaves which appear in January. The flowers comprise a pale green, purple margined spathe which is cowl-shaped and which partly shrouds the club-shaped, purple-brown spadix. Under a ring of hairs near the base of the spadix are the male flowers, below which is another ring of hairs with the female flowers below that. These tiny flowers appear from April to May. It is an unusual perennial dominated by the pale green spathe or modified leaf, also often spotted and edged in purple. After the plant has been pollinated, green berries appear on the spadix, gradually turning through yellow to bright red. This is a plant commonly found in shady hedges, woodland and laneways. It is a native plant belonging to the family Araceae. My first record of this plant was in Adare, Co Limerick in 1977. The first photograph was taken by me at Tintern Abbey, Co Wexford in May, 2010, the berries having been photographed in autumn 2009.